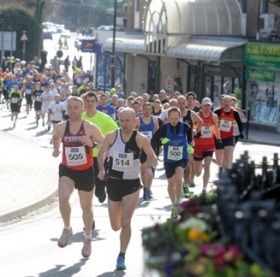 The Sudbury Fun Run, an annual charity 5-mile run and Sponsored Walk, is one of the major long-standing sporting events in our town – it has now been taking place in various forms since the early 1980s. Each year the organisers choose a local and a national charity to be beneficiaries of the Fun Run – and this year the Kernos Centre is fortunate enough to have been selected as the deserving local charity. The Fun Run is accompanied by a Sponsored Walk, organised by the Sudbury Joggers, which follows the same course and starts just after the Run – this is not a race as such, more a brisk stroll for those less atheletically inclined! This year’s events take place on Good Friday 3rd April, with the Fun Run starting from 9:15am. Full details of both events can be found here. We understand that – as of the beginning of March – the Fun Run itself is oversubscribed, although there is a reserves list. There are still places available on the Sponsored Walk however so, if you are interested in participating, and at the same time contributing to a worthy local cause, please follow the above link to apply.